Our kids like a bit of variety from time to time when it comes to their typical lunchbox or afternoon school snacks. So this week I made a big batch of these coconut orange and date truffles. Coconut is easy to digest for their little tummies and are a healthy form of saturated fats for their growing bodies. Dates are rich in several vitamins, minerals and fibre. Great for Oscar's constipation issues too! The massive health benefits of dates have made them one of the best ingredients for muscle development. So here's a jar of pure goodness. Blitz the dates (try and soak them in some milk for a couple of hours to allow them to soften as it becomes a beautiful caramel sauce). Add a sprinkle of cinnamon, 1/2 tsp vanilla essence & coconut oil, rind of 1/2 orange and enough macadamia meal until it binds. Add your milk until you get a dough like consistency. 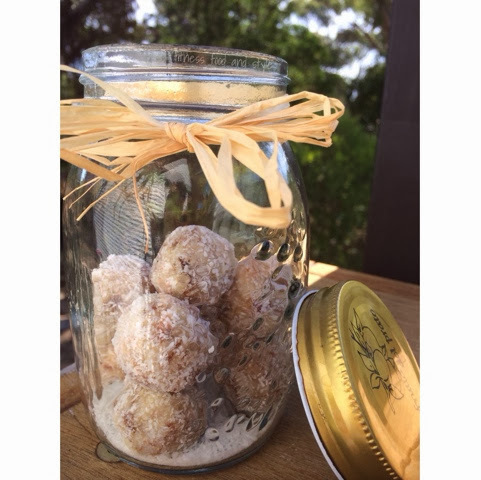 Roll bite size balls into desiccated coconut and refrigerate until it's snack time! This is a super healthy alternative snack for those days kids are wanting something sweet as they are still trying to go sugar free from our recent #FebFast challenge. What are some of your favourite no added sugar recipes?